1. Put the oats in a bowl, and mix in about 1-2 Tablespoons of each color of glitter. 2. Cut the zippered tops off each baggie and pour ½ cup of oat mixture into each baggie. Make sure to pour it into the corner of the baggie. 3. Now, take a pipe cleaner and tie each baggie closed. Twist it a few times around and leave the ends sticking up. Bend each of the ends back and forth a few times to resemble antlers. 4. Glue two googly eyes and a red pom on each bag and you’re done! 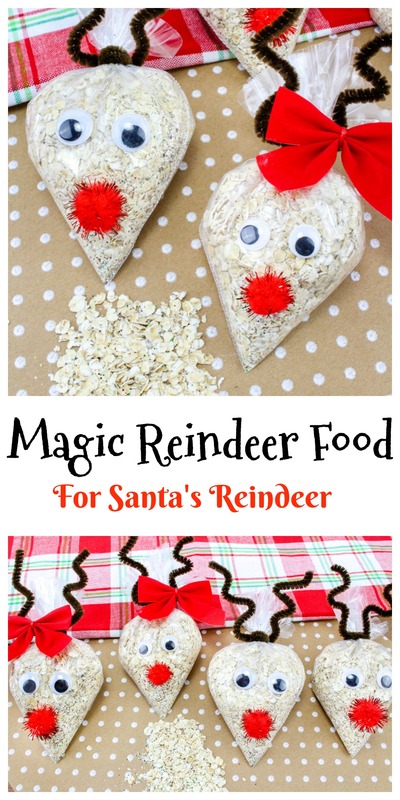 Spreading Magic Reindeer Food is such a fun idea for the kids on Christmas Eve. Like my kids do, on Christmas Eve your kids can sprinkle some magic reindeer food outside on the lawn to feed Santa’s reindeer! I might suggest having the kids watch where they step, though. Otherwise they will end up tracking all that glitter back into the house and as you know, it’s hard to get rid of! Magic Reindeer Food is really easy to make and it brings the kids so much joy to make this special treat for all of Santa’s reindeer on Christmas eve. I love that it has sparkly glitter in it! These are just adorable and kids will have a ball with them. That is such a cool idea! I’ve always loved leaving out cookies for Santa and food for the reindeer. My youngest son’s teacher did this a few years ago and it was the first time I’d seen it. I think it is such a cute idea! These are super cute. I remember doing a similar craft as a child and enjoying it, and my youngest usually does something similar but completely edible as well. What a cute idea! This would be a fun tradition to do with the kids every Christmas Eve. Adorable and so easy to do! What a fun craft for the kids. Plus a wonderful treat for Sanat’s reindeers. I am sure they need a snack to after all their hard work. This is such a cute idea. My daughter will want to make one I’m sure. She’s all about glitter. Too cute! There are deer near where we live so I would probably make this with edible sugar dye and leave it near the deer camp. This would make a great craft for our Sunday School nursery. What a cute idea! This will be a great thing for the kids to do Christmas Eve! Oh my! These are adorable! I just know my young daughters would love to make these this holiday season. Bookmarking this! We used to make this when I worked in a prek classroom. We had a station set up for the kids to make it at the Christmas party. It was always one of their favorites. Awesome! My kids will love this. They are so excited for Christmas and this reindeer food will pump up their excitement even more! Thank you so much for this really cool idea. So creative! I love the sparkles idea and how these have turned out. I am definitely trying this out. My little one is always looking to do something different every year, so this lines up nicely! thanks for sharing! We made magic reindeer food last year at our local bookstore. Our magic reindeer food wasn’t as cute as yours though…. and someone may have forgot to put it out for the reindeer. Whoops! I guess this means we’ll have to do it again. Thanks for the reminder. You are making new traditions for so many families. This project is so cute and so nice to remember the raindeer too. I love so much christmas! because everyone come with a new idea fr decoraion or food that is even better than the last one! We never thought about making some reindeer food! What a cute idea! Some years we’ll make food for the reindeer. We used to just set carrots out! This year, we may make this magic reindeer food! What a cute little Christmas craft. My boys and I tend to make reindeer trail mix but this is a different fun way to celebrate Rudolph and his buddies. It does sound like it could be a fun new tradition! What a super cute idea! I have sene reindeer food for sale in stores before as a novelty gift for kids, now making it at home? Makes it even more special! Now this would get the kids excited for Christmas. I think it’s so much fun and it’s adorable too! It’s something that the kids could make with you. Okay now this is super cute! I really want to make this with my daughter. She would love it! This looks like such a fun treat to make for the kids this Christmas. I know my kids would love to help me make these! This is such a great idea for my four year old. My girls always loved feeding the reindeer when they were little. I love these adorable baggies you put the food into! I love this! What a great idea! My kids will love making this and sprinkling it out for the reindeer. What a fun idea for Christmas! 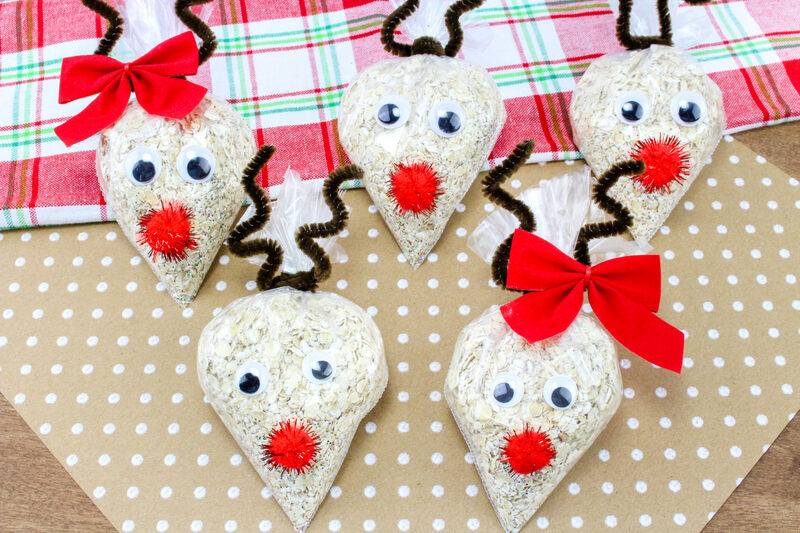 I love this idea and used to make reindeer food with my kids when they were young. It was such a fun tradition that we did yearly. Added these to my Pinterest board. My 7-year-old would love to make this on Christmas morning! What a great idea! My kids would love this ! So creative. I love it. My kids would love thisi too! You’ve got to have the shimmer so the reindeer can see the food from way up high. Love this sweet mix for the reindeer. How cute! 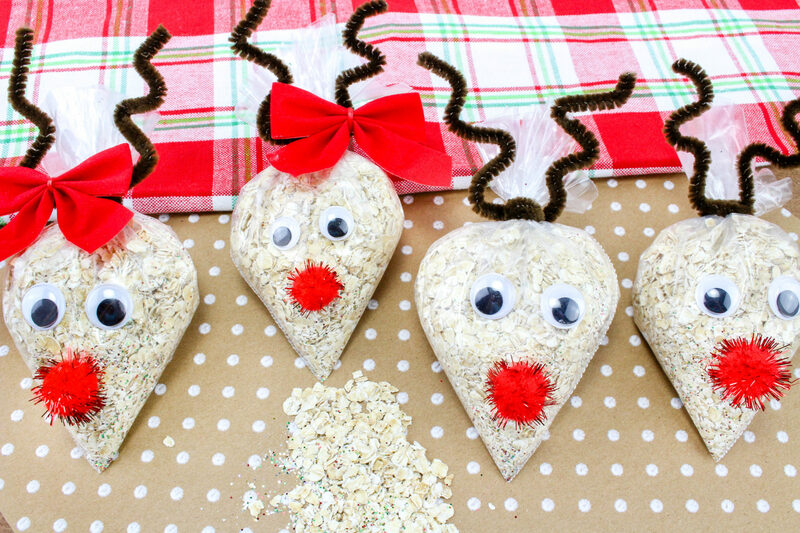 My littles will love adding making reindeer food to our holiday traditions. Santa can’t get all the snacks. This is such a cute idea! The kids would be elated over this! This is a really cute idea! My kids will love this for Christmas! These are adorable. Such a fun idea for the kids and holiday season! This is too cute! WE always do carrots for the reindeer , but I think something like this would be a lot of fun too! So cute! What a fabulous and fun idea for the little kids. Mine would love doing something like this especially my boys, they are so excited for the holidays! Every year I say I am going to do this and I never do. This is adorable! I am saving this to remember to do this with my kids! The homeroom Mom from my children’s classes always makes this for Christmas to give to the kids. It’s a fun thing for kids to do too. I love this and how adorable would this be next to Santa’s cookies! I would buy this at a craft show for a reasonable price! So much fun! Will need to try someday. Seems like something my nephews would love to do. Perfect for the holidays! I remember my grandma making us stuff like this growing up. I am going have to make some for my daughter. I think she will love it. She is three and really excited about Christmas. I know a bunch of kids that would love this! Of course, you need to leave out food for the reindeers! This kids are going to love this one. This is a really cute idea, Robin! What a lovely craft to do with the kids this season! I’m sure they’ll be even more excited to welcome Santa with treats for his reindeers. You can’t forget to feed Santa’s reindeer on Christmas Eve. They do a lot of the hard work for the big man. What a fun way idea to do with your kids. This is so cute! My kiddos do this as well every Christmas Eve. I love the reindeer faces on the bags. This is so cute! My daughter brought some home from school last year, and I knew we needed to make some again this year. This is so cute! I am going to have to make this with the kids this year. I totally think it’s an adorable idea. This is awesome and my daughters would love to help prepare it to leave out on Christmas Eve! Such a fun holiday craft. I totally need to make these with the kiddos before Christmas this year. What a darling DIY! I’ve made reindeer food for my class in the past and think it’s such a lovely thing to do! I love how you’ve presented it, so cute! This is such an adorable idea! I can’t wait to do this Christmas project with my kids, they will LOVE it!!! This is a really fun tradition for the kids at Christmas. I could totally see my niece and nephew leaving out feed for Rudolph and company. These are too cute! My boys are obsessed with reindeer right now after some of the Christmas movies we’ve watched! What a darling idea. I’ve been looking for some crafts to do with my little ones once school lets out for the holiday and this is certainly something they would love making. That looks adorable. You can even let kids help you with this with it being simple and easy to make.